In order to set up your VOD site to use Verotel, this will take changes on Verotel's admin panel, and then setup within your VOD area. You will need a new website set up within their admin panel that's exclusively used for the VOD product here. This way, any sort of other transactions you have outside of VOD won't interfere with VOD. Both of these are available under the Website Detail page in the Verotel admin panel. 3) Once this is done, we will need you to go into this new website, and then choose "Flexpay Options" for this website. Where http://mysite.com/vod/ is replaced with the URL to your actual VOD area. 5) On the same "Flexpay Options" page, under Payment Options, please make sure only the credit card option is checked. We don't support Bitcoin or Direct Debit at this time. Once this is done, click Save. 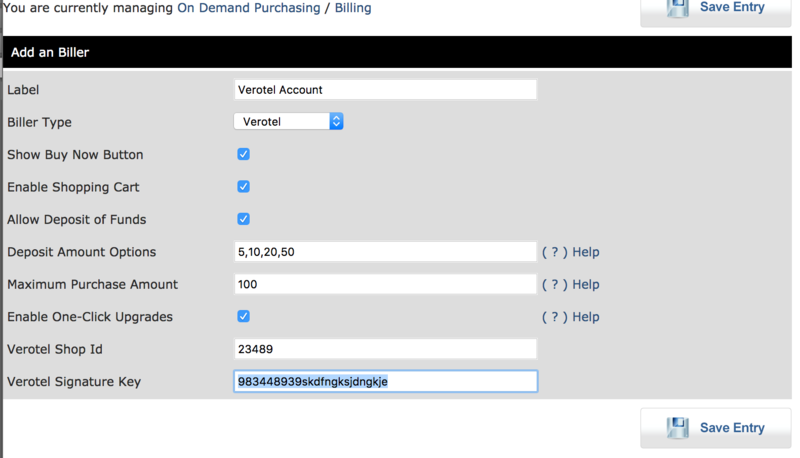 3) Under Biller Type, make sure you choose Verotel from the available options. 5) Make sure you enter the Verotel Shop Id and Verotel Signature Key you received from their admin panel.